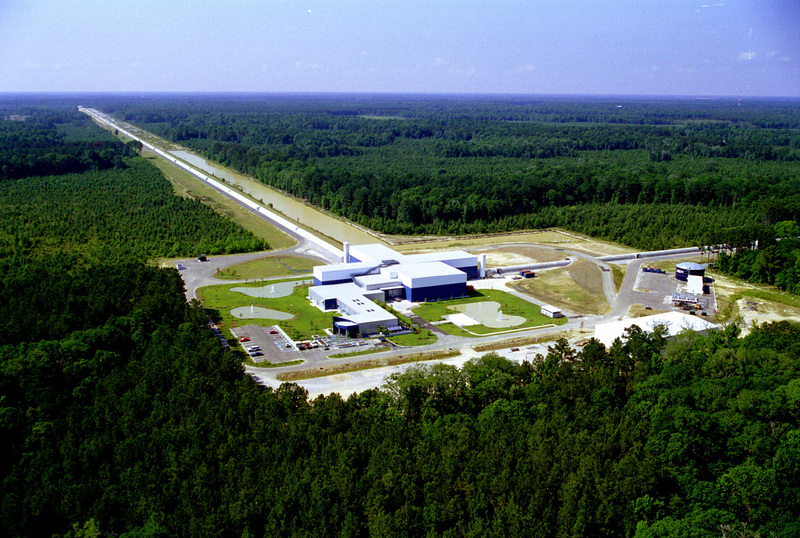 Laser Interferometer Gravitational-wave Observatory in Livingston, Louisiana. Each of the two arms is 4 kilometers long. LIGO has another such observatory in Hanford, Washington. Kip Thorne: Why was the black hole hungry? Stephen Hawking: It had a light breakfast! Black hole humor–you gotta love it. Unless you’re an astronomer, that is. Black holes are among the most mysterious and influential objects in the cosmos, yet astronomers cannot see into them, frustrating their attempts to make progress in fields ranging from extreme gravity to cosmic evolution. How do you observe an object that eats light for breakfast? Enter LIGO–the NSF-funded Laser Interferometer Gravitational-wave Observatory. According to Einstein’s Theory of General Relativity, black holes and other massive objects can emit gravitational waves–ripples in the fabric of space-time that travel through the cosmos. LIGO was founded in the 1990s with stations in Washington state and Louisiana to detect these waves as they pass by Earth. Just one problem: Gravitational waves are so weak, they change the length of each detector by just 0.001 times the width of a proton! “It is a difficult measurement,” allows Cavaglia. Seismic activity, thunderstorms, ocean waves, even a truck driving by the observatory can overwhelm the effect of a genuine gravitational wave. Figuring out how to isolate LIGO from so much terrestrial noise has been a major undertaking, but after years of work the LIGO team has done it. Since 2006, LIGO has been ready to detect gravitational waves coming from spinning black holes, supernovas, and colliding neutron stars anywhere within about 30 million light years of Earth. So far the results are â€¦ nil. Researchers working at dozens of collaborating institutions have yet to report a definite detection. When Advanced LIGO is completed in 2014 or so, the inner workings of black holes could finally be revealed. The punchline may yet make astronomers smile. Find out more about LIGO at http://www.ligo.caltech.edu/. The Space Place has a LIGO explanation for kids (of all ages) at http://spaceplace.nasa.gov/en/kids/ligo, where you can “hear” a star and a black hole colliding!